Foxconn's upcoming $10 billion display factory in Wisconsin is more lucrative to the Apple supplier than first thought, with state and municipal sweeteners adding almost an extra $1 billion in benefits above an existing incentive package worth $3 billion, increasing the burden on taxpayers. As part of the deal to open the 20 million-square-foot facility in Wisconsin, a package of $764 million in incentives has been provided by Mount Pleasant and Racine County, the town and county where it will be built, reports the Wall Street Journal. On top of this, the state of Wisconsin pledged another $134 million for the improvement of state highways and local roads near the site. The latest benefits are in addition to existing financial incentives, which primarily consists of $2.85 billion in income tax credits for job creation and capital expenditures. There is also a sales tax exemption worth $150 million as part of the $3 billion bundle. The state will be responsible for covering 40 percent of the public bonds used to finance all of the local expenses, in the event the project fails completely. In return for the incentives, Wisconsin will be the venue for the major LCD panel factory, which will create 13,000 jobs in the state over a number of years. The increase in employment could also be beneficial for areas near the facility, including local businesses seeing increased trade and changes in house prices. While originally believed to produce large display panels, it is thought the facility could end up producing small and medium-sized panels due to the transportation risks associated with bigger screens. 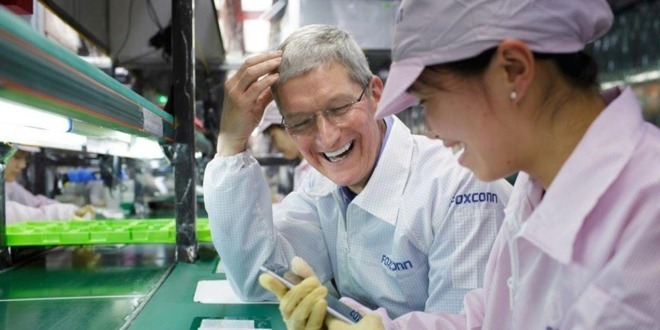 Considering Foxconn is a production partner for Apple products, and is the owner of iPhone and iPad display producer Sharp, it is plausible that some future iPhone screens could be produced from the Wisconsin facility in the future. In May, one report made the claim that iPhone screens would be sourced from the Wisconsin facility, but the issues with shipping US-produced components overseas for assembly could be too much of a liability for the project. The company will break ground in southeastern Wisconsin on Thursday.